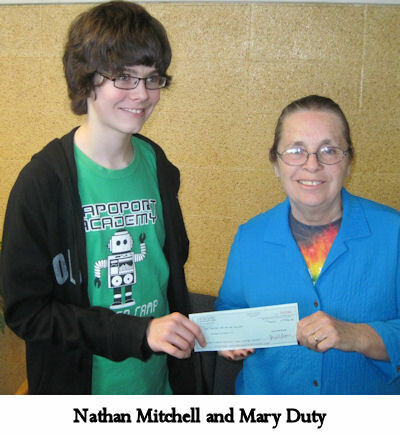 Nathan Mitchell won $100 from the Waco History Project for his project on the desegregation of lunch counters in Waco. Tell us about it, Nathan! My History Fair topic was integration in Waco during the 1960s. I chose this topic because it is unique, I’m pretty sure that no one else has done their project on this topic, it would be easy to make an exhibit from, and it is interesting to me. It was local, and I thought that it would be good to do a topic on something that happened in the town I live in. I knew that at least 1 person who worked for the newspaper was still alive, so I had primary sources I could access. Finding sources for this thing was hard, and I was pretty sure that I wouldn’t be able to find twenty sources for it. Luckily, the teacher bumped the required number of sources down to fifteen, so I had a better chance of getting the amount of sources I needed. I went to Baylor so I could go to the Texas Collection and find information there. I went through transcribed versions of oral memoirs and interviews by some of the people who were playing an active role in the integration process. I collected a good amount of information there, in addition to the sources that I already had. The whole exhibit was done over the weekend, two days before the due date, but I think it turned out great for the limited time I had to do it. I did the majority of the typing on Saturday, finished up the typing on Sunday and made the whole board on Monday. I had planned to make a documentary, but because of time problems, I could not do that. The board is completely black and white because all of the pictures were black and white, and also, I wanted to stand out from all the bright and colorful boards surrounding it. It was time consuming, and I had gone through several different drafts of the text part of it trying to keep it under 500 words and leave enough space for the captions. Eventually, I got the job done, though. My project relates to the theme for many reasons. The topic had much debate on whether to integrate or not and there were diplomats involved. The integration was a result of huge debate, and it took several years to complete the integration. The African American integration process, which started with the lunch counters and restaurants, was enforced and aided by the committee of 50, a group of people working together to integrate the city of Waco. If it were not for the decision to integrate the African American citizens, Waco might be still segregated at this time. 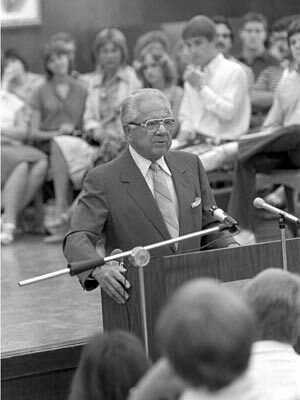 Leon Jaworski (below) spoke on "The Lawyer in Society" in a September 1980 lecture series to Baylor University law students. Waco student David Miller (left) recently won $200 for his paper on the Wacoan. 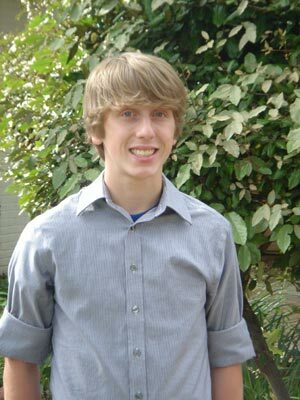 David Miller won $200 from the Waco History Project for his paper on famed Watergate prosecutor Leon Jaworski, a Waco native and Baylor graduate. Tell us about it, David! I first became intrigued with Leon Jaworski because my mother teaches at Baylor Law School, and the Law School has a replica of his office. When I started thinking about the theme for the 2008-2009 History Fair, "The Individual in History," Jaworski seemed like a good subject for my paper. I researched my topic at Baylor Law Library, Moody Library, the public library, the Texas Collection, and on the Internet. I found court opinions and other documents from the case to force President Nixon to turn over the Watergate tapes as well as other significant cases of Jaworski's. I found several books written by Jaworski himself. For example, the book Confession and Avoidance, Jaworski's memoir, was very informative. Also, I watched videotapes of lectures by Jaworski and read transcripts of interviews. I learned how he viewed the legal system and the responsibility of lawyers, and I chose to write about three cases that illustrate how Jaworski took a stand for the rule of law. Leon Jaworski did not always take the most popular position, but he was committed to the rule of law and the role of the legal system. His most significant impact was as special prosecutor in the Watergate matter. In that case, he stood up for the principle that no one, not even the President, is above the law and won a landmark Supreme Court case that forced Nixon to turn over the Watergate tapes and led to Nixon's resignation. In lesser known cases, Jaworski also reflected his commitment to the rule of law as well. Early in his career, when he was practicing law in Waco, he played an unpopular role by defending an indigent African American man who had killed a white couple in 1929. In the 1950s, he outraged many Southerners by accepting the job of prosecuting the governor of Mississippi for criminal contempt when the governor defied a court order and prevented an African American student from enrolling in the University of Mississippi. These are the three cases I chose to write about in my historical paper on Jaworski. I also discovered in my research some recently revealed information about Jaworski's role in the 1944 court martial and conviction of numerous African American soldiers at Fort Lawton in connection with a riot and lynching of an Italian prisoner of war. In the government's investigation into this case a couple years ago, it was concluded that the conviction of these soldiers was based on an unfair process, including error by the prosecutor, Jaworski, in failing to provide the defense an investigative report. This case was not a focus of my paper, but I included a paragraph about it to provide balance and show that Jaworski was not infallible. Overall, Jaworski's career reflected courageous commitment to the rule of law. Rapoport Academy students produce "Paul Quinn, Then and Now"
Students at Rapoport Academy High School recently presented an audio-visual program for the Waco History Project titled, "Paul Quinn, Then and Now." The public charter school is rapidly expanding on the campus of what at one time was the oldest predominantly black college west of the Mississippi. With a PowerPoint presentation accompanied by music from many eras, the students took visitors through a brief history of the college, which ranged from a heydey in which the student population exceeded 300 to later years when a fire destroyed two buildings and enrollment sagged. The students found out that Paul Quinn is mentioned for its debating excellence in the movie The Great Debaters. 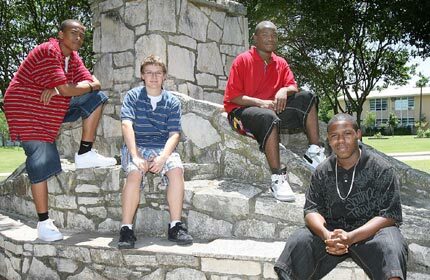 Gathered at the historic foundation on the Quinn campus are students (left to right) Joshua Davis, Nash Turbeville, Jerome Campbell and R.J. Napier. An updated local topic list for the 2008 Heart of Texas Regional History Fair. The theme this year is "The Individual in History." For more information, visit http://www.baylor.edu/historyfair/. For more information on submission rules and deadlines, please visit http://www.baylor.edu/historyfair/. First, I got on the internet and looked at many secondary sources about the Scopes Trial. I read biographies about the important people. I studied timelines. I went to the public library and checked out books to read for background, I went to the video store and bought a dramatized version of the trial called ‘Inherit the Wind’ which I watched. I also looked up old newspapers on microfiche at the public library. I read the main headlines and stories from Dayton. But, my main focus was on the local editorials and views. I understood from my research that this trial was the "talk of the day". Reading and understanding the editorials helped me understand the concerns of Wacoans. Some of the editorials tried to correct misunderstanding, some tried to keep calm Wacoans who were in an uproar, and some shared people's experiences and thoughts about the trial. G.W. 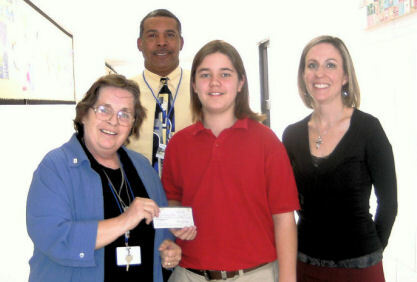 Carver Academy's Mackenzie Love receives a $100 check from the Waco History Project from teacher Mary Duty. Behind him is assistant principal Jerry Johnson. At right is his sponsor, Nelissa Graves. I chose to do a display board. First, I chose the display board because I am very visual and like to have everything laid out. I’ve done display boards and I enjoy making them. I also made a blog not for the competition because I enjoy modern technology and consider myself good at it. Go to www.scopesmonkeytrial.blogspot.com. Besides posting the information from the display board in the site, I also have some polls, and places to write your own opinion. “Conflicts and Compromises” relates to the Scopes Trial because of the conflict between creationism and evolution and what is the correct form of teaching. Another cool part about this is that the conflict still goes on. People are still debating Also whether to include creationism or evolution in science class today. As we began to preparing for the National History Day project, we considered this year’s theme – Conflict and Compromise. In considering the theme, we thought about topics that were meaningful to us. Social injustices have always been of interest to us, so we began exploring various events in history such as the Holocaust, slavery, and school segregation. After much deliberation, we decided upon the Civil Rights Movement. As we began my research, we quickly learned that this topic could be broken into numerous subtopics that seemed overwhelming. We talked with one of our mother’s about how we could narrow down our topic. Through this discussion, we decided to look at the various components of the Civil Right Movement in our county, McLennan County. This excited us tremendously as we thought of the possibilities that could be explored. Immediately we started focusing on the components of the Civil Rights Movement in McLennan County that we felt were relevant such as school segregation, housing patterns, and separate businesses that served only one sector of the community. As we began our research, one tragic event in McLennan County’s history came to light. The “Waco Horror”, as it has become known, was a shameful piece of history that involves the lynching and desecration of Jesse Washington’s body. 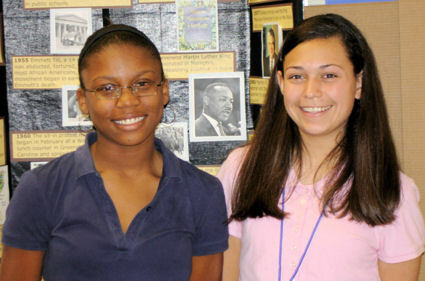 Shakayla Furlow and Lauren Hernandez shared a $100 prize from the Waco History Project in the 2008 Heart of Texas REgional History Fair for their project on civil rights in Waco. Here's their process paper. While most of our internet searches sited this event in McLennan County’s Civil Right Movement, we decided that this event would be included in my project, but it would not dominate the project overall. The experience of visiting the Baylor University Library was a bit overwhelming in that there were so many choices for resources. We found several books that were located in the Texas collection. This was very useful. One of our parents arranged the appointments to interview two community members. We were very nervous about talking to them. We wrote out questions beforehand so we would be prepared. Both of the men we interviewed were very eager to share their stories. The hardest part of this project was narrowing down the information to put on the board. We had much more than would actually fit on the board. We had to go back and eliminate some of the events that seemed not to fit perfectly. Overall, we learned so much about the civil rights movement in McLennan County. Most of what happened here was happening all across the United States. In many ways, the events were a reflection of what was happening in other places. None the less, it is very easy to note the positive social changes that have occurred in our community. It was my goal for my third-grade class to learn about the history of the community in which they live. They would learn firsthand through a variety of experiences such as: field trips, interviews, independent study project, and presentations. This is a very short description of some of the types of activities students were involved in with this study of Waco History. How old were you when the tornado hit? Were you working, going to school? How did you hear about the tornado on that day? What do you remember about what happened right after the tornado? Through this oral history interview, students were able to gather information from a person who shared a part of Waco history. The questions often led to stories about what Waco was like then. Stories of where people worked or how schools were different back then than they were today. Students were excited to share their interviews with the rest of the class. This was one of the favorite activities students mentioned in their end of the unit evaluation. The day ended with a wealth of information. Many of our students had the opportunity to visit many of these places. Every student selected a different topic of study to research and present to the class. Students worked through an eight-step process and timeline to complete this project. Select a topic. Students could select from a list of Waco topics under three main areas: 1) special events, 2) Waco pioneers, 3) landmarks. Ask questions. Students had to narrow all of their little questions about the topic into one “big” question. Collect information. Notes and other types of information were kept in the students’ research folder. Develop a product / visual. 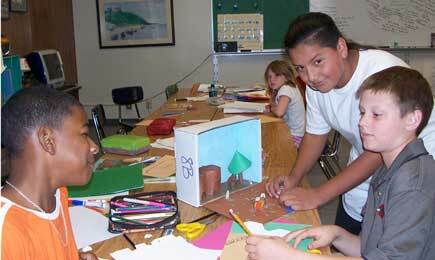 Examples included: creating a model, pictures, dressing as the person. Present information to the class. It was the students’ choice on how they were wanted to present the material. Examples include: posters, PowerPoint, and show. Evaluate the independent study. Students were involved in evaluating student presentations. Students shared their independent projects to the whole school in the school cafeteria. It was an opportunity to have parents, teachers, and other students ask questions and hear information about the topics of study. The third-grade students were able to be the “expert” and shine one more time as they proudly shared their topic of research. Bianca Ochoa is a third-grade teacher at Hillcrest Professional Development School. Mrs. Ochoa has been teaching at Hillcrest P.D.S for 14 years. Prior to that, she taught first-grade for five years and then served as a gifted and talented teacher for five years with Waco ISD. Mrs. Ochoa has an associate’s degree in child development. She has a master’s degree in curriculum and instruction in education with an endorsement in gifted and talented education from Baylor University and she is currently working on her dissertation to complete her doctoral degree in education psychology also from Baylor University. 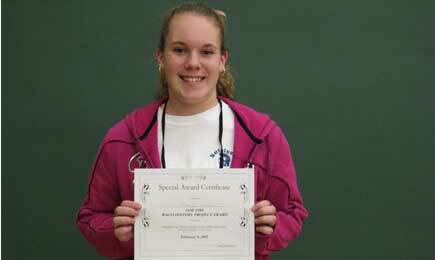 Katelynn Kaska’s Tragedy of the 1953 Waco Tornado was winner of the Waco History Project Special Award (Junior Division) in the 2007 Heart of Texas Regional History Fair. She is a student at West Middle School. She received a $100 prize from the Waco History Project. 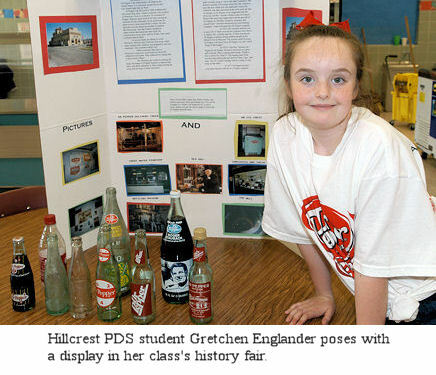 Hailey Henkel and Julia DeLaRosa of St. Louis Catholic School (picture unavailable) won the Waco History Project Special Award Group Exhibit, Junior Division, for It’s a Twister, It’s a Twister – Waco Tornado. They shared a $100 prize. Students: Start thinking now about an entry on Waco History for the 2008 Heart of Texas Regional History Fair. You could win $100. 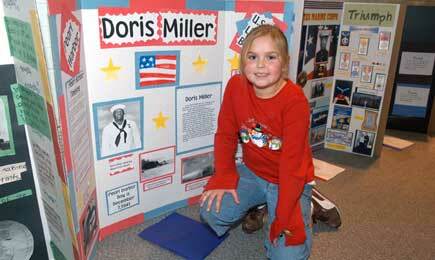 Amberlee Pendleton, a fifth-grader at Hillcrest PDS, did her history fair project on Waco World War II hero Doris Miller. She is in Mary Helen Battle's social studies class. 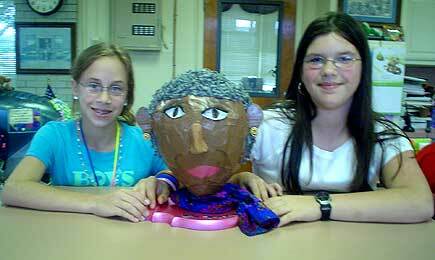 My fourth grade students in 2005--2006 studied Texas History all year, including events in Waco History. We compiled a Waco History timeline database and created shoebox dioramas for many scenes from Waco History. The result was a classroom museum of shoeboxes. We gave several tours to younger classes. Mountainview Elementary students Micah Click (left) and Sarah Vladut prepared a power-point presentation on Waco Mayor Mae Jackson and sculpture for the Waco Expo GT Product Fair. View it here. Teachers: Have any of your students done written projects about Waco history? We'd like to show them off here. These books have been reproduced in a PDF format that you can view online or download. nineteenth-and early twentieth-century “bird's-eye views” of cities throughout the United States. Texas Bird's-Eye Views is a Web site dedicated to the study and appreciation of the Texas city views in the museum's collection, along with a number of additional Texas views from private lenders and outside institutions. This is a wonderful site for both teachers and students. GraveNet: Visit this Web site to see how cemeteries can be fascinating travels through local history. This web page was created by the Academy of Information Technology at AJ Moore Academy. Visit our website.